For other uses, see Eagle Eye (disambiguation). The eagle eye is among the strongest in the animal kingdom, with an eyesight estimated at 4 to 8 times stronger than that of the average human. An eagle is said to be able to spot a rabbit 3.2 km away. Although an eagle may only weigh 10 pounds (4.5 kg), its eyes are roughly the same size as those of a human. As the eagle descends from the sky to attack its prey, the muscles in the eyes continuously adjust the curvature of the eyeballs to maintain sharp focus and accurate perception throughout the approach and attack. In addition to eagles, birds such as hawks, falcons, and robins have extraordinary vision which enable them to gather their prey easily. Their eyes are stated to be larger in size than their brain, by weight. Colour vision with resolution and clarity are the most prominent features of eagles' eyes, hence sharp-sighted people are sometimes referred to as "eagle-eyed". Eagles can identify five distinctly-coloured squirrels and locate their prey even if hidden. Eagle weight varies: a small eagle could weigh 0.7 kilograms (1.5 lb), while a larger one weighs 6.5 kilograms (14 lb); an eagle of about 10 kilograms (22 lb) weight could have eyes as big as that of a human being who weighs 200 pounds (91 kg). Although the size of the eagle eye is about the same as of a human being, the back side shape of the eagle eye is flatter. An eagle's retina allows for a higher Nyquist limit. Its retina is more pronounced with rod cells and cone cells. In the eagle, the retina's fovea has one million cells per mm as compared to 200,000 per mm in humans. Eagles have a second fovea and three eyelids (two of which are visible). The second fovea in eagles gives them better and sharper vision while the long, narrow ribbon-shaped area that connects the two eagle foveas is inferred to be a third fovea. The phenomenon of an eagle turning its flexible head almost 270 degrees, while sitting or flying, is attributed to the fact that when its large head is turned fully its eyes are also turned, unlike a human. An eagle in flight can reputedly sight a rabbit two miles away. Talon–eye coordination is a hunting imperative. From its perch at the top of trees, the eagle can dive at speeds of 125–200 miles per hour (201–322 km/h) to catch its prey by its talons. Eagles, in their young age, cannot locate fish below water as a result of refraction error of the eye, so they compensate by grabbing dead fish floating on the surface. 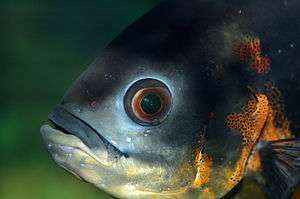 As they grow older, the refraction error naturally rectifies itself and they are able to spot fish below the surface. The fierce look of the eagle is due to the placement of a bony ridge above its eyes, the small amount of bare skin between its eyes, and its sharp beak. The feathers on its body generally do not grow over the eyes. The ridge protects the eyes from protruding tree branches when it perches on trees, and also from prey which struggles to escape. Each eagle eyeball moves separately. The eyeball is so large and so tightly fit that the eagle can barely turn it within the socket. That the eyes are located in front of its head with face forward and looking slightly askew is an advantage. Though its hearing does not match its eye power, mating calls are said to be heard for several miles. Eagles blink up as their top eyelid is larger than the bottom one; the additional inner eyelid is known as a nictitating membrane, which “grows in the inner corner of the eye, next to the tear duct”. Eagle tears moisten the eyes and contain the chemical lysozyme which protects against salt water and also destroys bacteria, thus preventing eye infections. The nictitating membrane acts a sweeping wiper across the eye. The eagle iris is a pale yellow colour, much lighter than human eyes. Both eagles and humans have a white area called the sclera, but in the case of eagles, it is hidden below the eyelid. Eyelid openings are oval-shaped in humans, while they are round in the case of birds' eyes. Most eagles have excellent vision. Generally, eagles do not suffer from myopia (nearsightedness) and hyperopia (farsightedness); those who have these defects cannot hunt easily and eventually starve to death. Eagles have the unique feature of the pecten. Its function is not clearly understood, but the general belief is that it helps to nourish the retina, keeps it healthy without blood vessels, facilitates the fluids to flow through the vitreous body at an appropriate pressure, absorbs light to minimize any reflections inside the eye that could impair vision, helps perceive motion, creates a protective shade from the sun, and senses magnetic fields. "Bald eagle (Haliaeetus leucocephalus). The prevailing color of this bird’s fundus is dark reddish-brown, the lower half changing to a dull orange-red. The whole eyeground is covered with choroidal capillaries, and dotted over with brown pigment grains, giving it a rough, granular appearance. A gray sheen pervades the upper part of the fundus. On the temporal side and some distance from the upper end of the optic nerve is a brilliant, white, round dot surrounded by a small, light-green reflex ring, which is itself enclosed in a very brilliant, narrow green ring—the muscular region. On the nasal side of the disc, and on a level with this macula is another area, of a gray color, surrounded by a fan-shaped, luminous reflex. The optic nerve-entrance is distinctly white, and along its center is strewn a large number of minute pigment dots. The outer margin of the disc is bordered with black pigment, as if a shadow were cast upon it by the pecten. In this regard and in some others, this fundus resembles the eyeground of the sea eagle." 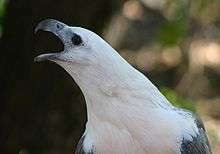 "White-bellied sea eagle (Haliaeetus leucogaster). The coloration of the eyeground is mostly dull-brown, the lower quadrants of the field being covered with dull, orange-red capillaries evidently choroidal. The optic disc is a long white oval, whose center is tinted with orange and covered with tiny pigment dots. The papillary margins are white bordered with black pigment. The upper half of the fundus is covered by a mass of dull gray dots. There is a well defined reflex near both maculae, each similar in position to that seen in the kestrel. These areas are evidently very sensitive to light, as the bird becomes very fidgety and irritable when the reflected rays from the mirror are thrown directly on one or other fovea. The pecten is very large and comes well forward towards the posterior surface of the lens. Both extremities of the organ are clearly visible through the ophthalmoscope. There are very opaque nerve fibers to be seen in any part of the eyeground." 1 2 3 4 5 6 Grambo 2003, p. 11. 1 2 3 4 5 6 "Vision: An In-Depth Look at Eagle Eyes". Bald Eagle Journal North. Retrieved 1 November 2012. 1 2 3 Dudley 1997, p. 10. ↑ Boothe 2001, p. 235. 1 2 Hutchinson 2000, p. 34. ↑ Potts 2006, p. 16. ↑ Potts 2006, pp. 11-13. ↑ Wood 1917, pp. 90-. ↑ Wood 1917, pp. 91. Boothe, Ronald G. (16 November 2001). Perception of the Visual Environment. Springer. pp. 235–. ISBN 978-0-387-98790-3. Dudley, Karen (1997). Bald Eagles. Weigl Educational Publishers. p. 10. ISBN 9780919879942. Grambo, Rebecca L. (14 December 2003). Eagles. Voyageur Press. ISBN 978-0-89658-363-4. Hutchinson, Alan E.; Silliker, Bill (1 April 2000). Just Eagles. Willow Creek Press. pp. 34–. ISBN 978-1-57223-277-8. Potts, Steve; Ueblacher, Sigrid Noll- (2006). Wildlife of North America. Capstone,. p. 11-. ISBN 9780736884839. Wood, Casey Albert (1917). The Fundus Oculi of Birds, Especially as Viewed by the Ophthalmoscope: A Study in Comparative Anatomy and Physiology (public domain ed.). Lakeside Press. pp. 90–.